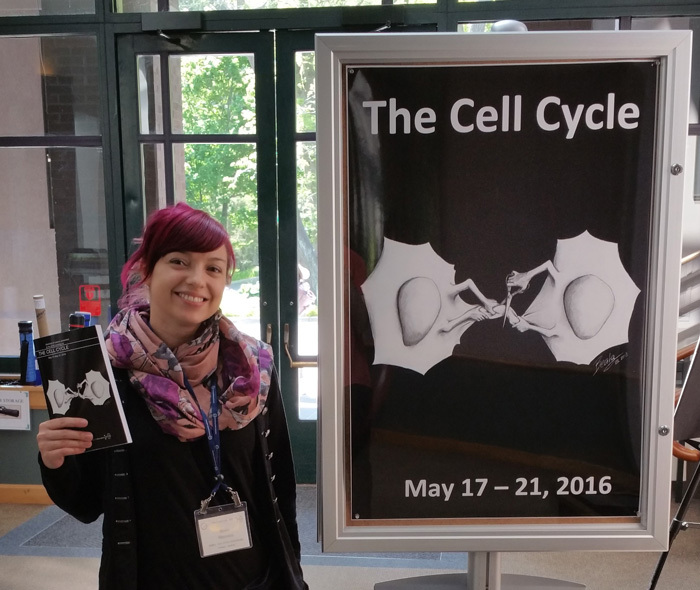 Cover and abstract book at the Cell Cycle Meeting in Cold Spring Harbor. In the final step of cell division, the bridge connecting the cells is cut to give rise to two separate daughter cells. Guest post by Beata Edyta Mierzwa. GSA-art features the creative works of scientists, particularly geneticists. Read more about the series from GSA President Stan Fields. If you would like to submit your own work or nominate someone else’s, please send an email GenesToGenomes@genetics-gsa.org with “GSA-Art” in the subject line. I used to draw a lot—mostly portraits of my friends—before starting my studies in molecular biology at the University of Vienna. I went to Switzerland for my Master’s thesis at the ETH Zürich, and recently finished my PhD in Daniel Gerlich’s group at the Institute of Molecular Biotechnology (IMBA) in Vienna. During my PhD, I realized that showing a drawing as part of my scientific presentations sparked interest and tended to stay in people’s memories. This is one of the initial reasons that I began making science-themed art. I have been very lucky to be part of an institute that encourages creativity, with yearly Art & Science contests and many other opportunities to present my art. I recently had the great honor to have my drawing selected for the cover and abstract book of the Cell Cycle Meeting in Cold Spring Harbor, and I was overwhelmed by the positive feedback I received. It was an incredibly rewarding experience that encouraged me to start creating art work for other people’s research as well as my own. You can find a complete gallery on my website (www.beatascienceart.com). When devotion begets emotion – the life of a PhD student. These portraits of my fellow PhD students illustrate the intense emotions researchers face in everyday life in the lab. These drawings were part of a contribution to the Art & Science contest at the Vienna Biocenter, for which my team received the first prize in 2013. I have always loved art, and have always loved science. I realized that combining these passions creates a unique way to communicate science. With my illustrations, I highlight fundamental scientific aspects in an unconventional and memorable way. I want to add some creativity to the conventional forms of scientific communication, with the aim to spark interest inside and outside the scientific community. Every drawing is an experiment! To separate our DNA during cell division, the mitotic spindle pulls the duplicated chromosomes towards opposite poles of the cell. 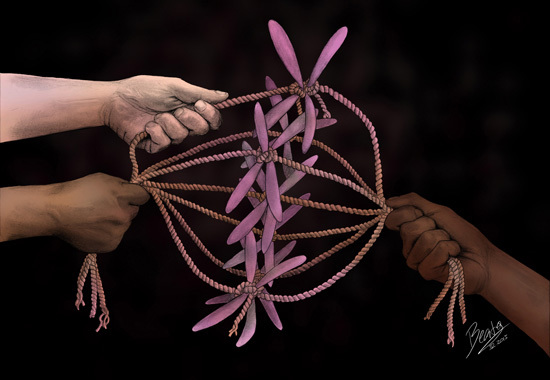 This hand-drawn illustration shows how chromosomes align in the equator of the cell during metaphase before they are separated into each of the two daughter cells. The angle of the mitotic spindle during cell division affects the decision-making of differentiation and thus ultimate position within the brain. 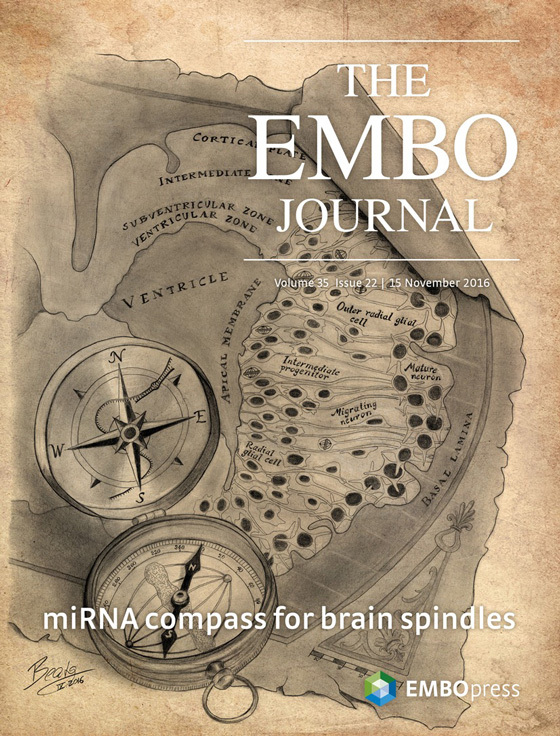 This illustration was recently selected as the cover for an issue of EMBO Journal, accompanying a paper I was involved in during my Master’s thesis. I work on cytokinetic abscission, the final step in cell division that separates the emerging daughter cells. Abscission is mediated by a machinery composed of the Endosomal Sorting Complex Required for Transport (ESCRT)-III. 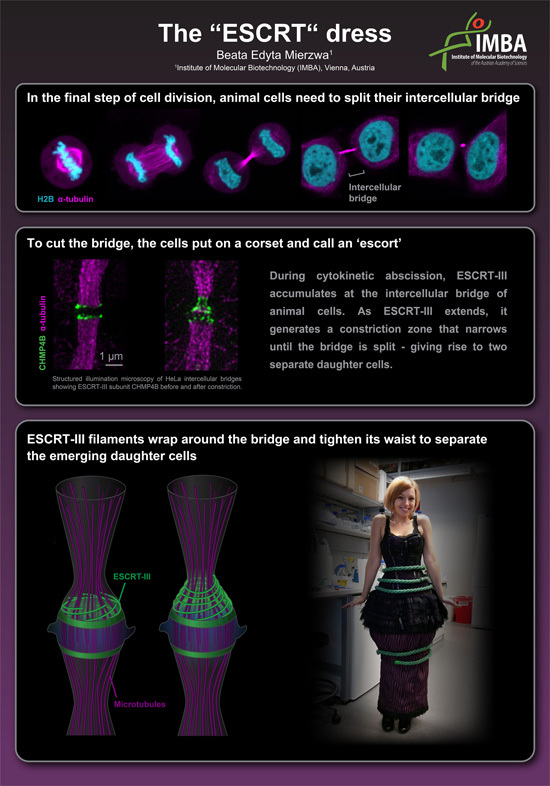 ESCRT-III is thought to form polymers that constrict the intercellular bridge until the membranes split. ESCRT‐III mediates membrane deformation and fission not only during cytokinesis, but also in various fundamental cellular processes, including multivesicular body formation, virus budding, plasma membrane repair, and nuclear envelope sealing. Current models propose that persistent filaments drive membrane constriction. However, whether ESCRT-III polymers exchange their subunits with soluble cytoplasmic pools—like other force-generating filament systems such as actin and tubulin—is not known. My research project focuses on investigating the dynamics of this fascinating machinery, with the aim to shed light on how ESCRT-III polymers reorganize to drive membrane constriction and fission in a large diversity of cellular processes. To illustrate how ESCRT-III splits the intercellular bridge during abscission, I created an “ESCRT” dress. This was a contribution to the Art & Science contest for the institutes at the Vienna Biocenter.